Back when we still lived in New York’s Hudson Valley, Kelli and I would occasionally take trips into New York City, which was just a train ride—or a 1.5-hour drive—to our south. One such trip was a “date night” to see the band Chicago at the Beacon Theatre. We started off the evening with dinner at Calle Ocho, a well-reviewed Cuban restaurant on Manhattan’s upper west side. After we were seated, one of the restaurant’s runners brought over glasses of water and a bread basket. Reflexively, we sent the bread basket back, explaining that we couldn’t eat it. And what was this incredible and naturally gluten-free bread? Pan de yuca. It has many variants throughout Latin America, but they all share common elements. The base is tapioca flour (some versions also add a bit of corn meal) and queso fresco or a similar farmer’s-style cheese (some people use mozzarella as well). 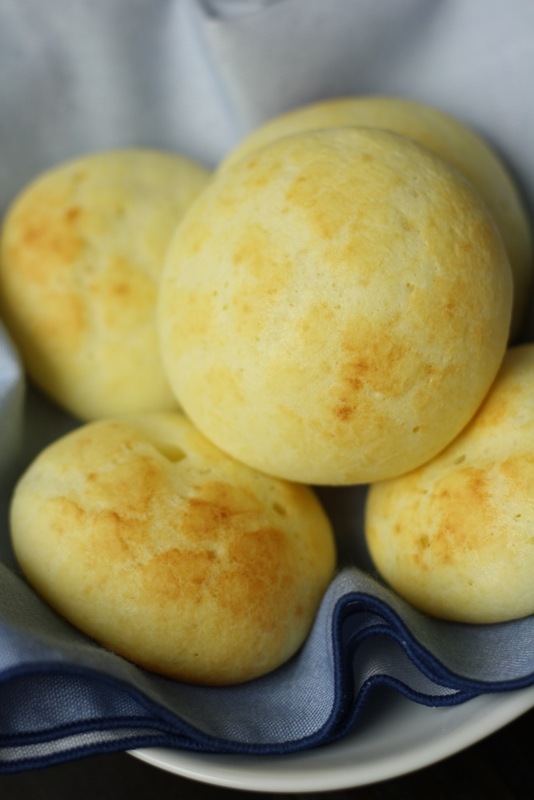 From country to country, it may be known as pan de bono, pan de queso, pao de queijo, and a handful of other names. All translate to one word: delicious. The bread is best served warm from the oven. 2. Put the cheeses in a food processor and pulse until crumbly. 3. Add the tapioca flour, baking powder, salt, and blend to combine, about 30 seconds. 4. Add the egg, and pulse to combine. 5. Add the milk, and mix until a sticky dough forms. 6. Scrape the dough out of the food processor onto your work surface. 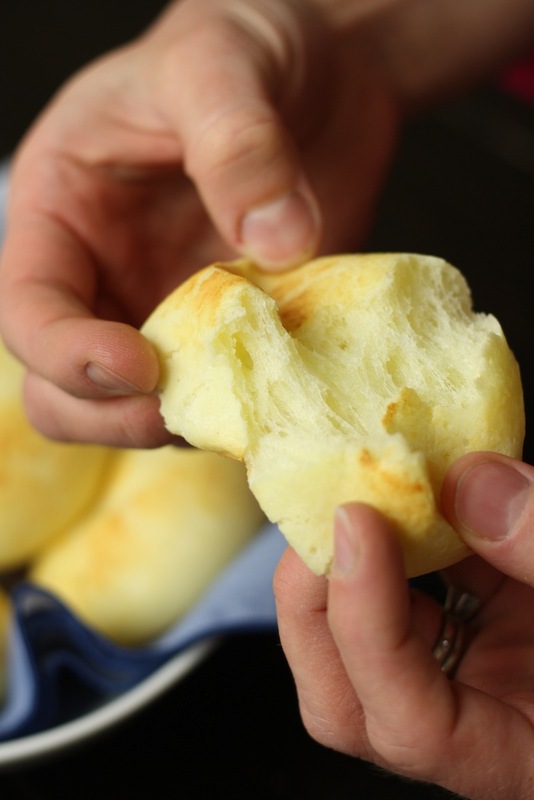 Use your hands to mold it into a dough ball. The dough will be slightly sticky. 7. Roll the dough into 10 balls and place evenly spaced on an ungreased cookie sheet or baking pan. 8. Place the pan in the freezer for five minutes. 9. Transfer directly to the preheated oven, and bake for 15 minutes. 10. Switch the oven to broil, and leave in just until the tops of the rolls are golden brown. 1. If you’re measuring the cheeses by weight, you don’t need to shred and/or cube them. Let the food processor do the work for you! 2. While the bread is best served warm, it’s also quite tasty at room temp. Or, you can place it in the microwave for a few seconds to re-warm and return to its just-out-of-the-oven goodness. This recipe is: gluten-free, peanut-free, tree-nut-free, fish-free, shellfish-free, soy-free, corn-free, grain-free, vegetarian. Those rolls look great! I’ve made pao de queijo before but mine did not come out looking at nice as yours. The recipe I tried was slightly different than the one you have posted here, so I’ll try yours next time. Thanks! These look amazing! I’ve had these before but never made my own. looks helllllla good. 🙂 Saving this recipe! these look amazing! Any chance they can be made dairy free by omitting the cheeses? OPG724 – Unfortunately, this bread cannot be made without the cheese. We tried decreasing the amount of cheese in the recipe and the bread became hard and dry. You could try substituting dairy-free cheese, but I am not sure how the results would be. These are delicious! I made them dairy-free by using Daiya cheese–mozzarella and cheddar-style. I also added some garlic salt, dried basil, and a dash of italian seasoning…..inspired by the biscuits at Red Lobster. They were great! I used goat cheese as I couldn’t find the other, they turned out fabulous. Thanks. A good alternative for those that can’t have gluten! Angie M – Thanks for letting us know they work with dairy free cheese. It sounds like a great combo with the additional seasoning! Jeanette – Thanks for the tip about the goat cheese! I made these last night. They were fantastic! Do you happen to have nutritional info on them? i.e. calories. I’m wondering if you could freeze until ready to bake?? (instead of just leaving in the freezer for 5 min) and how long to leave them out before baking when taking out of the freezer! These look yummy! Yes I am from Ecuador and I usually make these bread at home. I always freeze them. Just preheat the oven and place them in the pan. It takes about 25 minutes to bake. I know they are ready when the borders look brown. Thank you for sharing! 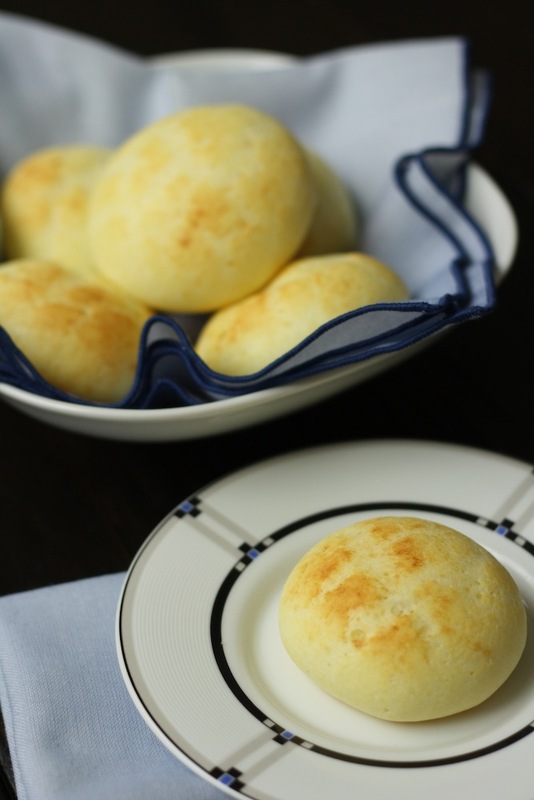 This is a variation of a famous brazilian recipe we call “pão de queijo” or “cheese bread”! I tried another recipe without eggs using just tapioca flour, cream cheese (or our cream cheese: “requeijão”) and a special cheese made in Brazil! It was delicious! Erin M – I would like to try these. What did you use for the other cheese? i’m dairy free as well. Mine came out sort of flat, not at all like a round bun. It was also kind of doughy inside. I followed the recipe exactly as it says, but I think I need to make some adjustments. Any advise? They freeze great. Either before baking or after! So glad I found this recipe! I love Calle Ocho! I also love the black bean dip they serve with the rolls. Have you tried making that? We haven’t tried replicating the black bean dip, but that’s a good idea! Looks delicioso, but where is the Yuca in this recepie? It looks and sounds delicious!!! I’ll definitely try it.